Identify your unique horsey skill, be poisonous plant prepared and teach your pony some awesome tricks! Plus get ready for summer with our horsey-hairdressing feature plus a super article about bridle cleaning – always useful! 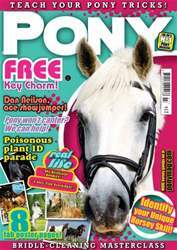 Don't miss out on July PONY Mag, its so cool!